Just as pharmacists have the mortar and pestle, and doctors have the caduceus, Emergency Medical Technicians have a symbol. Its use is encouraged both by the American Medical Association and the Advisory Council within the Department of Health, Education, and Welfare. 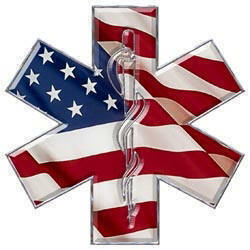 The symbol applies to all emergency medical goods and services which are funded under the DOT/EMS program. We see the "Star of Life" constantly, whether it be on ambulances or uniforms. But how many realize what this symbol represents and how it was born? Designed by Leo R. Schwartz, Chief of the EMS Branch, National Highway Traffic Safety Administration (NHTSA), the "Star of Life" was created after the American National Red Cross complained in 1973 that they objected to the common use of an Omaha orange cross on a square background of reflectorized white, which clearly imitated the Red Cross symbol. NHTSA investigated and felt the complaint was justified. The newly designed, six barred cross, was adapted from the Medical Identification Symbol of the American Medical Association and was registered as a certification mark on February 1, 1977 with the Commissioner of Patents and Trade-marks in the name of the National Highway Traffic Safety Administration. Each of the bars of the blue "Star of Life" represents the six system function of EMS. The snake and staff in the center of the symbol portray the staff Asclepius who, according to Greek mythology, was the son of Apollo (god of light, truth, and prophecy). Supposedly, Asclepius learned the art of healing from the centaur Cheron; but Zeus - king of the gods, was fearful that because of the Asclepius knowledge, all men might be rendered immortal. Rather than have this occur, Zeus slew Asclepius with a thunderbolt. Later, Asclepius was worshipped as a god and people slept in his temples, as it was rumored that he effected cures of prescribed remedies to the sick during their dreams. Eventually, Zeus restored Asclepius to life, making him a god. Asclepius was usually shown in a standing position, dressed in a long cloak, holding a staff with a serpent coiled around it. The staff has since come to represent medicine's only symbol. In the Caduceus, used by physicians and the Military Medical Corp., the staff is winged and has two serpents intertwined. Even though this does not hold any medical relevance in origin, it represents the magic wand of the Greek deity, Hermes, messenger of the gods. The staff with the single serpent is the symbol for Medicine and Health and the winged staff is the symbol for peace. The Staff with the single serpent represents the time when Asclepius had a very difficult patient that he could not cure, so he consulted a snake for advice and the patient survived. The snake had coiled around Asclepius's staff in order to be head to head with him as an equal when talking. The Winged staff came about when Mercury saw two serpents fighting, and unable to stop them any other way placed his staff between them causing them to coil up his winged staff. The Bible, in Numbers 21:9, makes reference to a serpent on a staff: "Moses accordingly made a bronze serpent and mounted it on a pole and whenever anyone who had been bitten by a serpent looked at the bronze serpent, he recovered." As a means of identification for medical equipment and supplies for installation and use in the Emergency Medical Care Vehicle-Ambulance. To point to the location of qualified medical care services and access to such facilities. For use on shoulder patches worn only by personnel who have satisfactorily completed DOT training courses or approved equivalents, and for persons who by title and function administer, directly supervise, or participate in all or part of National, State, or community EMS programs. 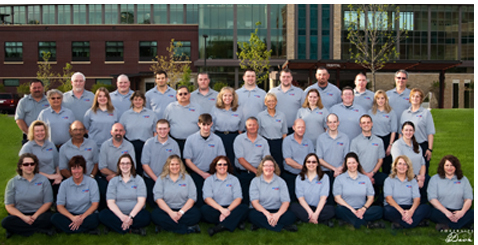 On EMS personnel items - badges, plaques, buckles, etc. Books, pamphlets, manuals, reports or other printed material having direct EMS application. The "Star of Life" symbol may be worn by administrative personnel, project directors and staff, councils, and advisory groups. If shoulder patches are worn, they should be plain blue "Star of Life" on a white square or round background. The function, identifying letters or words should be printed on bars and attached across the bottom separately. The edges of the basic patch and functional bars are to be embroidered. Administrative and dispatcher personnel must use a silver colored edge, and the staff of Asclepius should be with a silver colored serpent. These items do not need a white background. The shoulder patches and other EMS patches may be displayed on uniform pockets and the symbol can also be placed on collars and headgear. Thank you to the anonymous person who submitted this. What is the Star of Life? The Snake: an Ancient Greek symbol of eternal life. The Staff: an Ancient Greek Symbol of Support. Combined it shows the meaning of human efforts to support and fight for life and protect it as long as possible. The blue star: a symbol of the angels. With the snake and staff on top of the star it is a reminder of our jobs as EMS... we fight for life in an attempt to keep it going but we always must remember who we are fighting. Remember this the next time you have a code and you look up to see the Star of Life on the window of your rig or on the t-shirt of your partner.